One of my servers was under attack from an IP in China recently (some lame automated SQLi), but I figured I’d blackhole the source IP anyway. My first step was to blacklist in Dome9, which I use to manage that server’s firewall, but after noticing that the attacks were still hitting my server I remembered that because I also use Cloudflare and those attacks were getting tunnelled through their network. So the solution (for that particular attack) was to also blacklist the source IP in Cloudflare. When another stupid attack came in a day or so later, I did the same and realised that it would be much easier if I automated the whole process. So I threw together a Bash script (and then a Python script) that leverages the Cloudflare and Dome9 APIs to submit a given IP address to one or both services. I’ve put these into my scripts repo on GitHub. Simply insert your Cloudflare and/or Dome9 API keys into the configuration portion of the script and go. Using this you could conceivably fully automate it by auto-detecting brute-force type attacks using a script on the server and calling this script to make the blacklist updates. Bearing in mind these were very hastily put together, any feedback/improvements are welcome! I recently came across a Windows 2000 server that was found to have been compromised. During the investigation, both the Guest and Support_388945a0 accounts were found to had been placed in the Administrators and Remote Desktop Users groups (as the server was internet facing). Things got interesting however, when we removed these accounts from those groups and disabled them both. After logging back in a short while later, both Guest and Support accounts had been re-enabled and put back into the Admins and RDP groups. After some analysis, none of these files were found to be inherently malicious, but are instead used by a malicious batch script to enable the Guest and Support accounts with a specific password, and add them to the Admins and RDP group. The 1.exe file, for example, is just a executable with account-management capabilities. At this point it’s fairly evident what’s going on, this bat script is being run periodically, and runs 1.exe to ensure that both the Guest and Support_338945a0 accounts are present, and in the Administrators and Remote Desktop Users groups. It also sets the password to both of those accounts to ‘QQqqaa123321’. If you find these files on your system, consider that server compromised. Remove the files and disable those accounts in the first instance, but a full rebuild is highly recommended to rule out the possibility of other backdoors or rootkits. These types of batch scripts are not uncommon for backdoor trojans. However, I couldn’t find any references to this particular backdoor, so thought I would post about this in case anyone else searches for information about it. Note that at the time of writing, this batch script is not picked up by any anti-virus software. With Google offering $20,000 for a Chrome sandbox exploit, Apple releasing fresh security updates, and the organisers allowing researchers to target mobile phone basebands, it was sure make for an interesting Pwn2Own contest at CanSecWest this year. For the fifth year running, Pwn2Own invited security researchers to discover vulnerabilities and develop exploits for the most popular browsers on Mac OS X and Windows (for some reason Linux is left out this year). Traditionally IE, Firefox and Safari have gotten exploited, with Chrome being the last browser standing at last year’s competition. Google upped the ante by making it significantly more attractive to target their browser this year. This issue was a nice catch, discovered by Aaron Sigel who has a detailed explanation, video demo and proof-of-concept on his blog. It probably goes without saying, but Safari users should run Software Update as soon as possible. Apple has released QuickTime 7.6.9 for Leopard 10.5.8 and Windows (XP,V,7), patching a number of vulnerabilities including several that were fixed in the recent 10.6.5 update. The vulnerabilities include improper handling of JP2, AVI, MPEG, Flashpix, GIF, PICT, and QTVR files. Viewing maliciously-crafted files can lead to remote code execution in some cases. QuickTime definitely needs more strengthening. Leopard and Windows users, go forth and patch! Armitage, by Raphael Mudge, is a great little user interface for Metasploit which allows you to easily discover targets, deliver exploits, and manage your attacks to do things like pivots without any hassles. Once msfrpcd is running, simply launch Armitage using the script provided and click Connect (you may need to check the Use SSL checkbox). 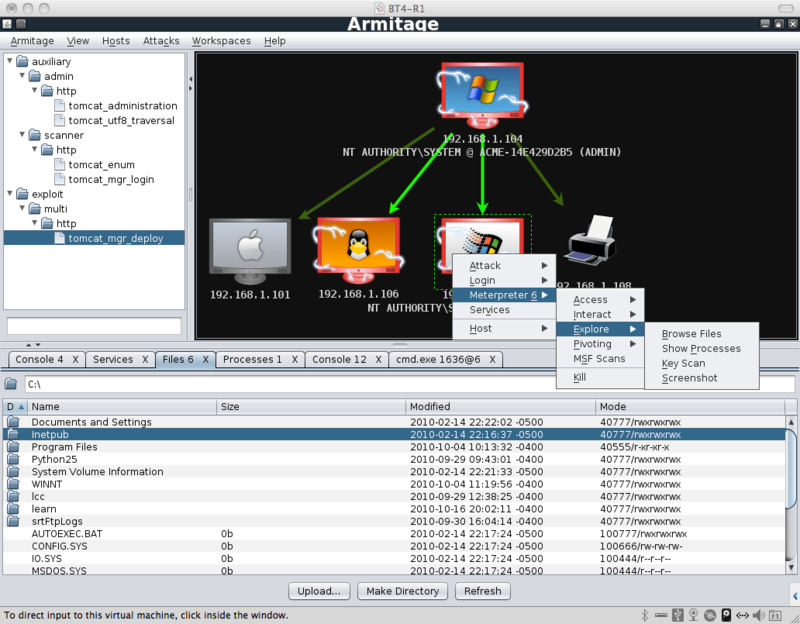 Armitage is written in Java, and works in Linux, Windows and Mac OS X. Download it here. [Update] Armitage has been added to the Backtrack repos. Here’s a short tutorial, and check out the video tutorial below. [Updated 21/01/2011] Hak5 episode 882 features a tutorial with mubix and Mudge (Hak5). Adobe recently released Adobe Reader X, the latest incarnation of their PDF viewer software. Over a year after Adobe’s promised ‘security push’ into Reader, and numerous vulnerabilities, exploits and malware, this version finally brings the hotly discussed sandboxing feature. The sandboxing, or Protected Mode as Adobe call it, would restrict PDFs to an extremely limited running environment. Initially the sandbox will control any write operations attempted by PDFs, to try and prevent malware being written to disk. A later update is expected to bring ‘read’ control as well, to prevent information stealing. Although this is a good step forward for Adobe Reader, it remains to be seen whether any of their changes will be effective at mitigating vulnerabilities that attempt to read/write directly from memory. It’ll be interesting to see what kinds of vulnerabilities will come out in the coming months. 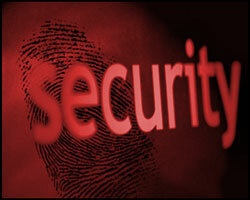 Either way, Adobe Reader X brings a number of security fixes and improvements, and is thus a recommended update. Safari updates 5.0.3 and 4.1.3 (for both Mac OS X and Windows) have been released to patch a number of WebKit vulnerabilities, some of which can lead to arbitrary remote code execution. Fire up your Software Update! Hit the jump for full details of the vulnerabilities fixed. Apple has released Safari 5.0.2 and 4.1.2 updates for Mac OS X and Windows which fix issues in both Safari and WebKit (the browser’s rendering engine). The first issue, which only affects Safari on Windows systems, may lead to code execution if the user attempts to reveal the location of a downloaded file. The other two vulnerabilities include an input validation issue in WebKit’s handling of floating point data types, and a use-after-free issue in WebKit’s handling of elements with run-in styling. Both of these could be used to perform arbitrary code execution. These two updates should be available in Software Update. Hit the jump for Apple’s full patch info.